Virtual office phone systems are best suited for small businesses and medium businesses as they enable them to project a big business image. These phone systems are implemented through dedicated connections. 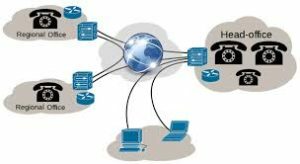 Virtual PBX systems have many sophisticated features that are not found even in the latest business phone systems. The features include virtual receptionist, auto attendant, find me follow me call forwarding, call transfer, voicemail, fax mail and so on. The auto attendant system presents a menu of options such as dial by name directory, dial by extension, zero out to operator and group dialing to the callers. The sophisticated interface presented to the callers can make your business appear a flourishing one. You can even customize the auto attendant to greet the callers with their own professional greeting messages. One can receive local and toll free numbers for the desired locations from the virtual PBX service providers. The calls can be routed to the appropriate person’s mobile number or residence phone number, whatever has been provided in the phone number list, irrespective of the person’s present location. If nobody is there to attend the call, the callers will be diverted to a voicemail system, where they can leave their messages. Customers can receive their faxes in their email account using the fax mail. Traditional PBX systems are expensive and require heavy equipments to be installed at the company premises. That is not the case with virtual office phone systems. These do not require any hardware or software to be installed at the user’s site. All the equipments are maintained at the service provider’s site itself. Moreover, these systems are scalable to a large extent; users need not worry about the additional equipments and phone lines needed while expanding their business, since all these are maintained at the provider’s location itself.